Maintaining gutters is a crucial part of home maintenance, and it is easy to forget how important our gutters are. Gutters can easily develop clogs and cause a mess of problems for you. From fallen leaves during the fall, and storms in the winter, gutters should be clear of large debris so that they can work the way they are supposed to. Many people clean their gutters by setting up a ladder and pulling out chunks of leaves and debris slowly, which can be incredibly time-consuming. You might not realize the dirt that is left behind that can accumulate quickly right after cleaning your gutters. Using a pressure washer to clean your gutters is not only faster but will definitely provide a better end result. All the large chunks of debris will be gone, and you will not need to worry about the little pieces you maybe could not reach since the water will push all that out as well. As always, safety comes first. Odds are, you will not be able to reach the gutters of your house with just the standard pressure washer hose. Before you just assume that your ladder will help you get there, there are a few things to remember. Pressure washers can have some serious kick back, and you might need to use a lot of pressure to push out clumps of wet leaves. Using a ladder and a pressure washer can be very dangerous, so consider using an extension instead. A telescoping wand is easy to install since it just connects to the hose of your pressure washer, and it can reach as high as 18 feet. To truly enhance your gutter cleaning, attaching a gutter cleaning wand to your telescoping wand will drastically increase the performance. Its shape allows access to the gutter without having to twist and turn in crazy ways. Simply stick it in and let it go. There is a great chance that you’ll get hit with some splashes, but it is a small price to pay for quick and easy gutter cleaning. After you have cleaned out your gutters, you will find that there is a mess of leaves and debris all over your property. While you could walk around and pick them up yourself, you already have your pressure washer out, so why not just use that and save some time? You could get two jobs done at once and just clean your driveway and patio with your pressure washer. Push the leaves into one section, then clean them up that way. 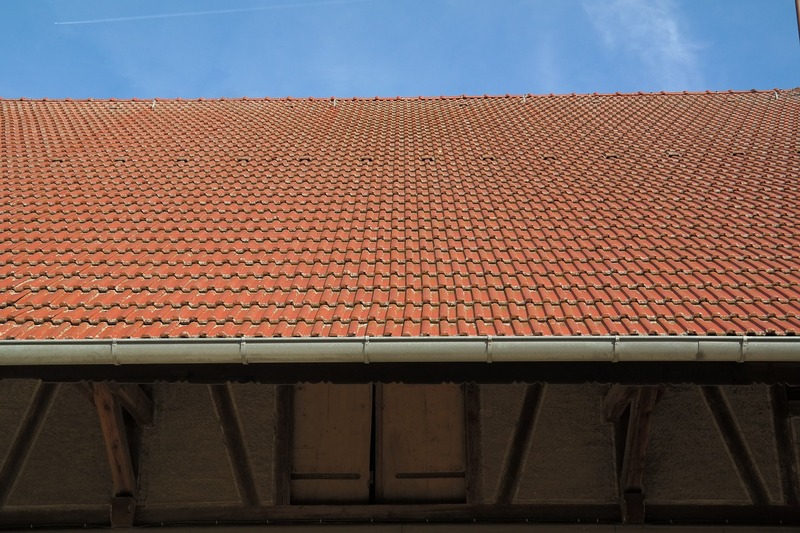 At the same time, you will have a bright and shiny looking driveway to match your clean gutters. If you wanted to save even more time, you can also invest in a water broom attachment for your pressure washer. A water broom usually has 2-3 nozzles that give a wider cleaning area. Depending on your pressure washer and the amount of PSI, you might only be able to use a smaller one. A two nozzle water broom is better for pressure washing units that have a small PSI output, like around 2500 or less. If your pressure washer can accommodate higher PSI, then you would be good to use a three nozzle water broom. Should I Use Detergent to Pressure Wash My Gutters? It is always recommended to use detergent to clean your gutters. If there are some tough stains, the detergent will help to rip apart that stain. Before you start cleaning your gutters with detergent, you should soak everything, even the surrounding area with clean water first. The water will give surrounding plants a barrier in the event some of the detergents get on them. You should also use a low pressure at first to avoid damage. You can use a really basic detergent, or follow our homemade recipe to clean your gutters. When you are ready to apply the detergent, it is important that you do not spray the soffits directly since that will just lead you to be a soapy mess. Instead, aim ahead of where you are and a little to the side so that is blows away from you. Additionally, you actually want to try to limit the amount of water that goes into the soffits as it can create mildew if it does not dry all the way. You can wait just a few minutes for the detergent to break up the stain, then switch to your higher pressure nozzle to get to cleaning. Flush out any remaining detergent first so you are not adding layers of detergent on top of what is already there. The best method for cleaning the gutter is to spray along your soffits and gutters to remove everything. For cleaning the inside of the gutter, use your gutter cleaner with the telescoping wand to spray right into the gutter. It is best to start at a downspout and work your away from it so that you can clean any clogs or debris that is closest to the downspout. Starting away from the downspout might cause a clog as you are working, which will make the job harder and possibly damage your gutter if the weight of the accumulated leaves and debris gets to be too much. Provide a pathway for all the debris to either wash out or be pushed out of the gutter. That being said, do not try to just get everything into the downspout. Excessive levels of build up might be better off with a quick scoop with your hands so your gutters do not get overwhelmed. The reason we might forget about our gutter upkeep is that they seem to get the most active during the winter months. Ideally, we would consider the gutters as a central part of general home maintenance. Given our busy schedules, it makes sense that we simply just forget to clean the gutter during the summer. Then, all of a sudden, a snow or rain storm rolls through and beings leaves, twigs, and debris on your roof that then settles its way into the gutters. This is one the most expensive damage might occur since frost and debris can lead to a ton of weight being pushed down on the gutters. Especially if you live in a colder climate, you might not want to bust out the pressure washer if you find you need to do an immediate clean up for your gutters. Instead, take the unpleasant and tedious route and cleanout chunks as soon as there is a thaw. Focus on corners and areas where debris might gather and scoop it out. While doing this, examine the gutters for leaks and that there are no gaps. While you are cleaning your gutter, you should definitely be checking for any damage or anything that looks like it will need repair soon. Luckily, there a few simple little things you can do when you catch some sign of wear or damage. If you find that the gutters are getting loose, do not stress. Spikes and ferrules are the most common tools used to hang gutters and sometimes the spikes will become loose. You can pound them back in, but they will definitely come loose again. If you want to further secure your gutters, you can install fascia hanger brackets by connecting it under the front lip and then screwing the other side in. In the event that water seems to get behind the gutter, this is easily fixed with a gutter apron. It goes under the shingles of your roof and hangs over the gutter. The apron can create that barrier to prevent the water from sneaking behind. One of the best minor repair hacks for your gutter is tying a nylon rope onto the gutter hangers into the downspout to prevent the noisy dripping that can occur. The water will get stuck to the rope and make a much quieter sound when it leaves the downspout; however, this does mean that you have less of a flow going out. Remove the rope before pressure washing your gutter.